Want a sneak peek at the next Hank the Cowdog book? It's called, "The Ghost of Rabbits Past," and will be released this fall! Talk about a rude awakening! Things go from bad to worse when Hank and Drover wake up in the wee hours of the morning to a full-fledged invasion of the ranch. It’s the coyotes, and they’re set on making a take-out dinner out of the resident cat, Pete. But, when Hank does Pete a favor and prepares to join him in what promises to be the next great Battle of the Alamo, things take an even more unexpected turn. The coyotes catch sight of Drover and decide to kidnap him instead! 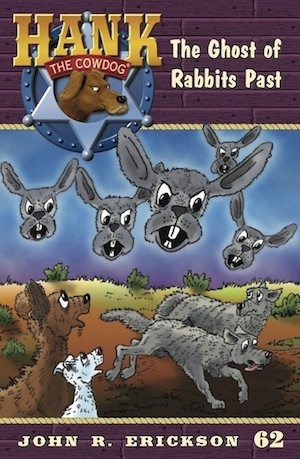 In the blink of an eye, little Drover is taken prisoner, and that means that Hank only has one day to figure out how to get him back before the coyotes make Drover their meal. Can Hank manage to get Slim to understand the situation, or will he have to go it alone? Or, will he get help from a very unexpected ally?